Florida’s beaches and waters, known around the world for their beauty, drew national attention this summer for another reason. Stories, usually with graphic photos, told of the damage done by the release of polluted water from Lake Okeechobee into major rivers, leaving “guacamole-like” sludge along riverbanks and ocean beaches. “Massive Florida Algae Bloom Can Be Seen From Space” read one headline. It was no surprise to Lynne Buchanan, whose photography projects foretold of the crisis to come. Buchanan, a 1979 graduate and daughter of Professor Emeritus Doug Berggren and former New College staff member Barbara Berggren, documents the beauty and the threats posed by pollution, sea level rise, and the effects of drawdown for human uses. “People seem to be finally waking up to the issues I have been trying to alert people to for the past five years,” she said. Her college friendship with student Scott Baker introduced her to Florida’s waterways and kayaking. With other students, she volunteered on a Mote Marine Laboratory project tracking dolphins. “I would go out and look at rivers and the bay, and I fell in love with Florida’s waterways,” Buchanan said. She began photographing Florida’s rivers in 2011. Her studies in art history taught her about composition, color and other principles that help her as a photographer. She spent much of 2015 kayaking across the state, including the 107-mile length of the Apalachicola River, along both coasts and in central Florida, and south to the Keys. Fellow alum Justin Bloom introduced her to Waterkeepers, people affiliated with the National Waterkeepers Alliance. She also worked with Novo Collegian Jason Evans, now teaching environmental science at Stetson University. On the Caloosahatchee, local rivers advocate John Paul said he and his friends grew up swimming in the river. But kayaking that day, he and Buchanan found the water “orangey-brown.” When Buchanan got off the water, her throat was sore from exposure to the water. She boated on the Indian River Lagoon and the St. Lucie River with Indian Riverkeeper Marty Baum. He showed her a visible line where the clear ocean water flows in on one side, and black water, from canals draining Lake Okeechobee, flows in on the other. 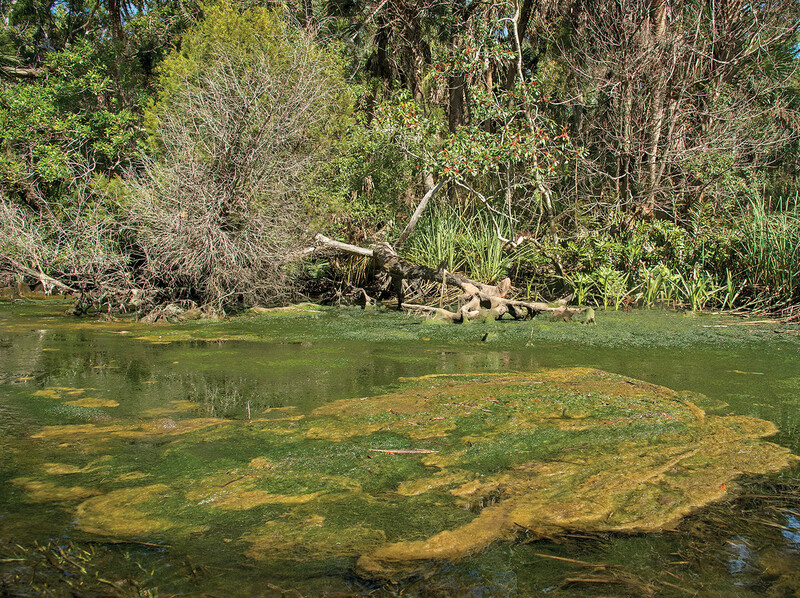 On the Chassahowitzka River, Buchanan found one of the saddest sights of her project, a nitrogen-fed expanse of green muck in the middle of the spring-fed river. She documented it all in a spring 2016 exhibit at the South Florida Museum. Her works also will be exhibited in spring 2017 at the Koman Fine Art Gallery in Vero Beach, a fund-raiser for the Indian Riverkeeper Association. She also is working on a book about Florida’s waterways, with an introduction by Robert F. Kennedy Jr. and an essay by Elizabeth Avedon. Not to mention most recently, one of Buchanan’s was selected as the opening photograph in a review in the Boston Globe, “Midges Ascending, Santa Fe River.” It is now on view at the Griffin Museum of Photography in Winchester, Mass until the end of August. She believes helping people re-connect with nature — whether at a museum or the outdoors — is an important step in the conservation of rivers, bays, creeks and estuaries in the Sunshine State. “People have to form a connection before they care enough to go do something about the issues,” Buchanan said. “And they need to realize that their health will be affected by the health of our waterways. You can see Buchanan’s photos from her exhibitions on Floridarivers at lynnebuchanan.com. New College students have created SailFuture, a nonprofit mentoring program for at-risk high school students. Cassandra Corrado’s work has taken her into emergency rooms, advising women who have been victims of sexual violence. Chelsea Jones '91 is back in Florida, as curator for digital collections for the University of Florida. A chamber music concert at Sainer Pavilion was a homecoming for a recent New College graduate.